It’s a Worldwide DUB Affair Baby! Join Dr. StrangeDub and DJ Baby Swiss (aka Capt. 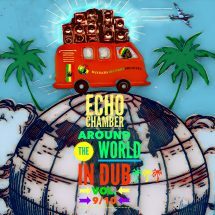 2much FreeTime) in the Echo Chamber your worldwide dub club. With the heaviest dubs, the most conscious roots, and the funkiest club beats, all chilled and mixed into a subsonic stew, the Echo Chamber is the hippest place to be every Wednesday morning from 2:00 to 6:00 a.m.
A typical show features a heavy dose of the latest roots & dub reggae and a potent shot of old school roots and dub. But dub just lays the foundation and holds the trip together: the DJ dub doctors cover the entire reggae rainbow, and they pull in the heaviest chilled beats from clubs around the world. For most shows, Dr. StrangeDub is at the controls for the first 2 hours, while DJ Baby Swiss “runs tings” in the second half of the show. DJ Baby Swiss (Elmar Romain) – DJ host for hours 3 and 4.